These Farm Heroes level 398 cheats and tips will help you beat level 398 of Farm Heroes. 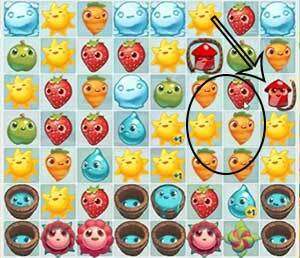 The objective of Farm Heroes level 398 is to achieve 100% growth and collect 8 flowers, 140 suns, and 30 rain drops. 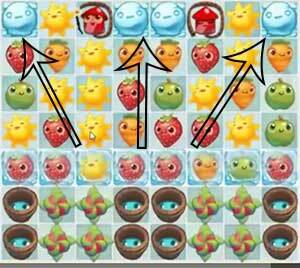 There are four tiles at the top of the board in Farm Heroes Saga Level 398 that spawn snow balls relentlessly. Try not to make combinations that will allow these snowballs to escape. They are on drugs and that is why they are stuck in their snowball prison. Look at them. Like animals, they don’t care what they do next as long as they’re going for their next huff. Well huff, huff little snow piggy, this is why you’re in jail! These snowballs may look friendly, but in reality, they’re cold. Cold as snow. Do not go with them to the movies, they just want to steal your car! If any snowballs make a break for it, blow their freaking heads off by making a match next to them. May that be a warning to the other snow balls out there. Boom time! Boom time! Boom time! Boom time! Boom time! Boom time! Boom time! Boom time! Boom time! Boom time! Boom time! Boom time! Boom time! Boom time! Boom time! Boom time! Boom time! Make matches next to the firecrackers to initiate this very special time. It’ll take a few goes, but when you do it right, oh boy. That’s a little something we in the biz call boom time. It’ll singe your chin hairs and make a man out of you. Especially if you’re currently a woman. They don’t tell you that when you download Farm Heroes Saga. 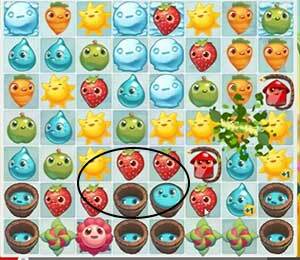 Water buckets are very useful on Farm Heroes Saga level 398 because they can make it rain. And on Farm Heroes Saga level 398 rain is the name of the game. In order to pass Farm Heroes Saga level 398 the player must collect at least 30 rain drops (also known as water cropsies). That’s a whole bunch of rain drops (alson known as water cropsies)! Collect these necessary cropsies by stimulating the water buckets until they spew all over the board like a bad, bad water bucket. Ooh they’re bad sometimes.